The U.S. economic picture is mixed, with some signs of slowing, along with areas of strength. Let’s take a look at the current snapshots to gain a more comprehensive view. To learn more about The Economic Picture, watch this video. 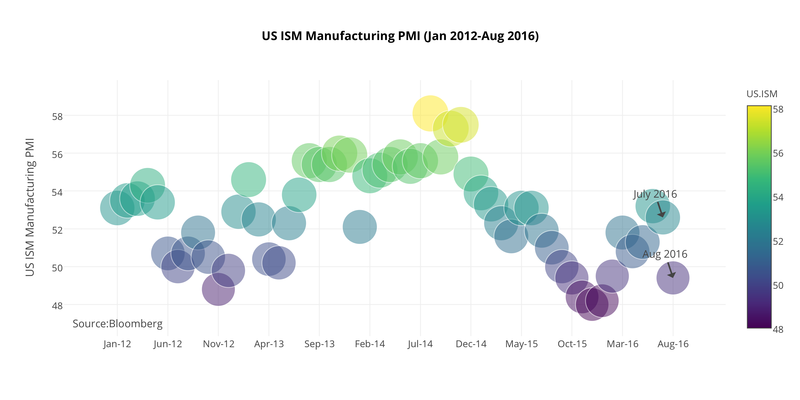 In our opinion, the most worrying data have been ISM Manufacturing Index readings. ISM Manufacturing declined to 49.4 in August from 52.6 in July, which points to continued weakness in a sector that has been a major drag on economic growth. However, the manufacturing survey has shown improvement since February 2016. Therefore, we’ll need to see more than one month’s reading in order to detect a change in trend. 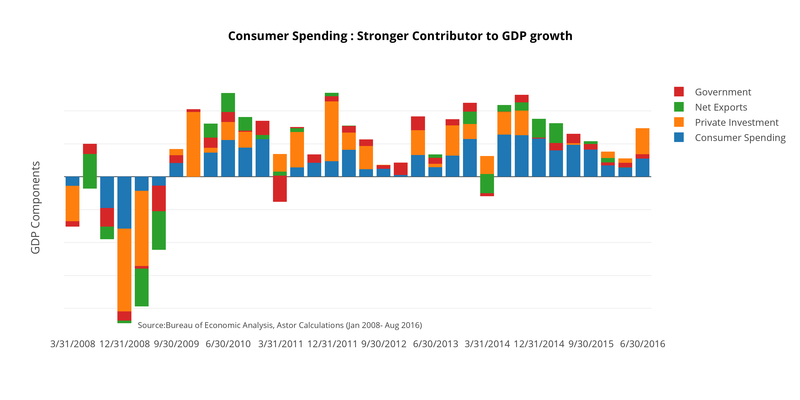 A more positive story is consumer spending, which remains robust and is the strongest contributor to GDP. Much of the rise in the preliminary Q2 2016 GDP came from 4.2% growth in consumption. Sustaining that strength in consumer spending depends largely on wage growth, which remains sluggish. 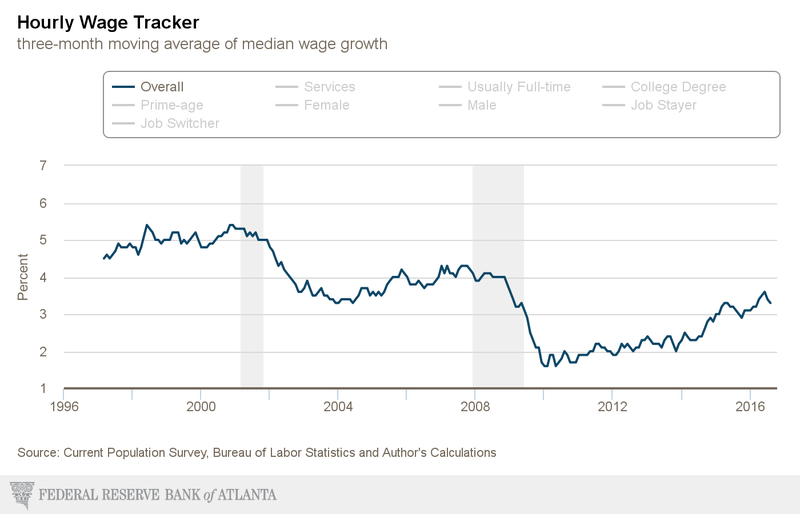 However, the Atlanta Fed’s Wage Growth survey shows the pace of wage growth is close to 3.6% year-on-year and accelerating rapidly, which is not far from the previous cyclical peak of 4%. Another slowing, but still robust indicator has been Non-Farm Payrolls, as labor market data show continued strength. Jobless claims remain relatively low and have been consistent with a still-strong trend in employment growth. Payrolls for August were below consensus, but our indicators, we believe, still point to strengths. The unemployment rate has been holding at 4.9%, and the U-6 underemployment rate remained at 9.7%. Within August’s private payrolls, manufacturing, construction and mining lagged whereas retail and financials showed the most growth. Weak productivity growth, at near 0, remains the factor that is holding down GDP growth, despite labor market strength. With disappointing productivity growth for several years, we believe a rise in investment as a share of GDP would be necessary in order to see any future productivity gains. As the third quarter comes to a close, it’s important to note that the “now-casts” produced by the Federal Reserve Banks of Atlanta and New York continue to show stronger growth for Q3 than the first half of the year. The Atlanta Fed is current forecasting a 3.7% seasonally adjusted annual rate of return (SAAR) for the third quarter. The New York Fed forecast for Q3 is 2.6%. These forecasts are significantly higher than their own respective final estimates for Q2, and also higher than the Bureau of Economic Analysis’ preliminary estimate for Q2 of 1.2%. (The third estimate for Q2 GDP will be released on Thursday). Overall, the consensus of economists’ estimates for U.S. economic growth looks stable, but have decreased to 1.54% for 2016 and 2.25% for 2017. Meanwhile, the Astor Economic Index® (AEI), the cornerstone of our fundamentally-driven, macroeconomic-based approach to asset allocation, shows the economy is growing—but at a comparatively slow pace. As always, we continue to keep our finger on the pulse of the economy to determine the current trend as we invest accordingly.